Wow you guys, when I asked Jessie to guest post on my blog for Fortnight of Fright I didn’t know that she was a fellow Neil Gaiman fangirl. Needless to say, I am insanely excited for you guys to read her review of the movie adaptation of Coraline! I absolutely adore Neil Gaiman’s books! His writing style tends to be equal parts whimsical and creepy. 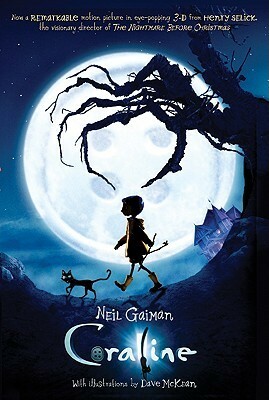 I’ve been a Gaiman fangirl ever since I read Coraline back when it released in 2002. I loved it! It was atmospheric and weird and just downright creepy! It didn’t take long to read and when I finished the only thought I had was how I wished they’d make the book into a movie. While Coraline the Book and Coraline the Film are very similar, they have some notable differences that help bring the story to the screen. But they both tell the story of a bored girl’s journey into another world that is so much like our own yet so different. Fast-forward to seven years after I had first read the book. I finally had my wish. 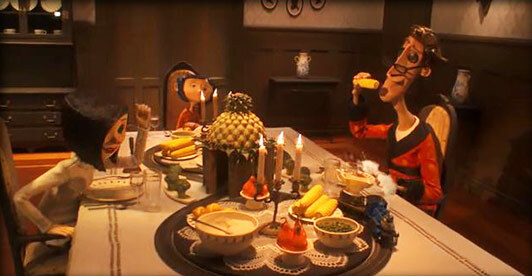 Henry Selick had made Coraline into a beautiful stop-motion movie! I was skeptical going in because how could this movie do one of my favorite books justice? I was so glad that to be proven wrong! The movie was fantastic! It had the same slightly morbid yet whimsically creepy atmosphere that the book had. It was so much more than I could hope for and is still one of my favorite book-to-movie adaptions and a movie I watch several times each October. In the movie, Coraline finds herself living in a cockroach-infested home horribly named the Pink Palace. Her parents spend hours on end inside, being dull, boring, and irritatingly inattentive. Their inattentiveness leads to Coraline exploring the house and meeting the neighbors such as the ex-circus star, Mr. Bobinsky and a pair of ex-actresses who fawn over their pasts and their Scottish Terriers. As she is wandering about she meets and reluctantly befriends a nerdy, awkward boy named Wybie and a sleek, black cat. Once Coraline finds her way to the other world, the movie has a powerful sense of foreboding when it reveals that her creepy “other mother” – as well all of the characters in this parallel universe – have black buttons for eyes. Yet, she disregards that once she sees what an interesting world this is compared to her old one. From gorgeous, Wonderland-like gardens to delicious meals, Coraline feels that she wants nothing more. Until her other parents reveal what she must do in order to get her wish. 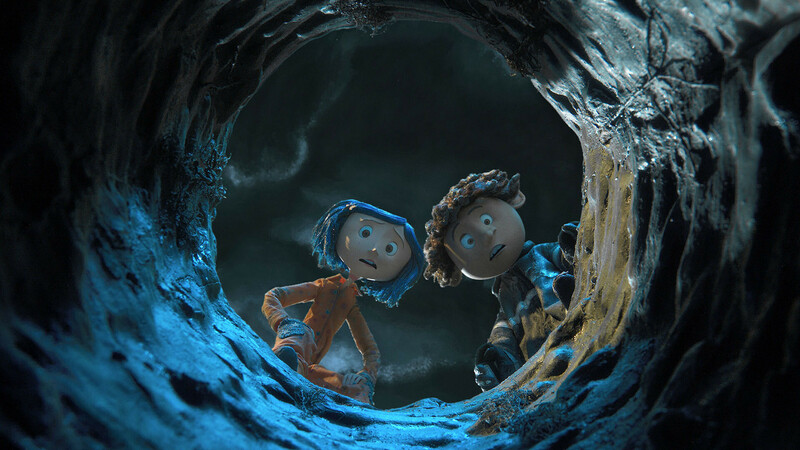 Instantly, the rest of the movie is unleashed into a wild, stunning adventure as Coraline musters up the courage she’ll need to fight a something she never thought she’d have to fight. The movie followed the novel pretty closely. To make the story come alive on the screen, some of the characters were changed, others were added, and some received different names. One of these characters was Mr. Bobinsky in the movie. In the book he’s usually referred to as “the crazy old man upstairs.” In the movie, Mr. Bobinsky loves radishes and stinky cheese yet radishes are never mentioned in the book. In the movie, Mr. Bobinsky has a colorful circus and circus mice in the other world. In the book, he only has rats and no circus. The film also adds Wybie and his grandmother that were never in the book. 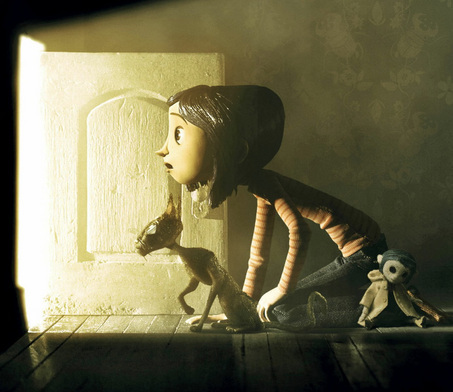 In the movie, Coraline makes several wonderful visits through the door into the other world (while the book is just one continuous visit) before Coraline realizes what a dangerous place it is. Wybie is one of my favorite parts of the movie. If you’re looking for a quick and creepy story for Halloween, this one fits the bill with the creepiness, the beautiful prose, and the frightening descriptions of the “other mother,”. Both the movie and the book with their fantastical characters, suspenseful action, and thrilling climax will have you at the edge your seat, silently cheering for our little valiant heroine. Excuse me while I go watch the movie again. Thank you so much, Jessie! 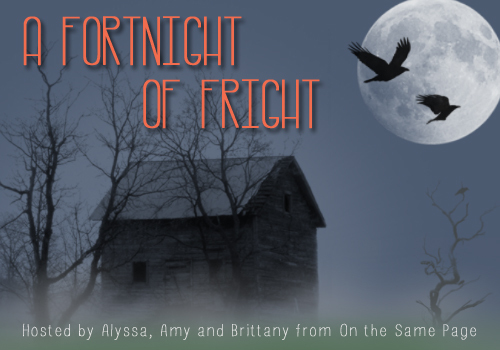 Don’t forget to head over to Amy and Brittany’s blogs and see what they have featured today! This entry was posted in Event and tagged Authors, books, event, Fortnight of Fright, guest post, neil gaiman. Bookmark the permalink.